The state unemployment rate continued its slow trend downward in March. 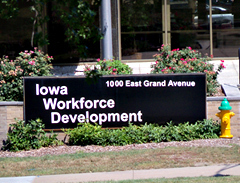 “The Iowa unemployment rate dropped to 4-percent and that’s the lowest it has been since 2008,” according the Ed Wallace of Iowa Workforce Development. The March rate is down from the 4.1-percent in February, and its the sixth straight monthly drop. Wallace says part of the drop in unemployment is driven by six straight months of increases in non-farm jobs. “Iowa added 3,300 jobs in the month of March alone,” Wallace says. “We see a lot of job growth in industrial construction in all four quadrants of the state.” The retail sector saw an increase of 1,800 jobs in preparation for increased summer traffic. Wallace says lower gas prices have given Iowans more money to spend on other items. The were some job losses, with the leisure and hospitality sector losing 1,100 jobs — 900 of the losses coming in accommodations and food services. Manufacturing lost jobs for the first time since October, with small losses occurring in both durable and nondurable goods factories. Overall though, Wallace says more Iowans are working this year compared to 2014. “Iowa’s unemployment is up 25,000 jobs over last year. The total number of Iowans employed is almost 1.7 million,” Wallace says. He says the state is getting close to a level where the percentage of people who want to find a job can find one. “Iowa is getting closer to full employment, but there’s always opportunities for folks to look for them (jobs). “We’re continuing to work with folks who have the greatest barriers to employment,” Wallace says. The number of unemployed Iowans dropped to an estimated 67,800 in March compared to 70,300 in February.